14th September 1728, New Hall Walk, Snow Hill, Birmingham, England. Son of Matthew Boulton senior the manufacturer of buckles and metal “toys” and Christiana Piers. One of four children of parents formerly of Chester. Reverend John Hausted’s Academy in Deritend, Birmingham. Left school at 14 to become a partner with his father. 1745: Boulton entered his father’s business. 1759: Death of his father leaving him his manufacturing business. 1760: Matthew Boulton represented the buckle makers of England before a House of Commons Committee. Began manufacturing Sheffield plate which was a process of laying a thin layer of silver on base metal. 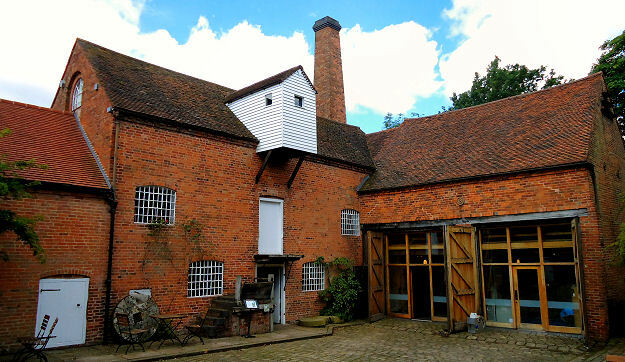 Sarehole Mill, Hall Green, Birmingham was used by Boulton before he moved to Handsworth. 1761: He leased land at Handsworth and began building the Soho Manufactory in Birmingham, which consisted of workshops, warehouses and dwellings for the workmen. Soho House itself was built in 1757. 1762: Boulton began to build the Soho Works. Started in partnership with John Fothergill to help him export products to Europe. 1766: Completion of the Soho Manufactory and restoration of Soho House. Foundation of the Lunar Society which met at Boulton’s house. Legend has it that the name came from the practice of holding meetings on evenings of the full moon so visitors good see their way home. The Society was originally founded by Boulton and Erasmus Darwin but later included such notables as James Watt, Benjamin Franklin and Josiah Wedgwood. Began manufacturing items in ormolu as well as jewellery, ‘toys’ (items such as gilded snuff boxes), Sheffield plate and sterling silver tableware. Boulton and his wife move into Soho House for the first time. Boulton had a tea house built in the garden for visitors to take tea after their visit to the factory which became one of the wonders of the modern world. He began to count amongst his friends eminent people such as Sir Joseph Banks, Benjamin Franklin, Sir William Herschel and Sarah Siddons. 1767: First visit of James Watt to the Soho works even though Boulton wasn’t present on his occasion. Boulton’s interests were wide and he was largely self taught. He studied chemistry, meteorology, astronomy, medicine, electricity, the arts and classics as well as music. 1768: Watt meets Boulton. His daughter Anne is born on 29th January. He is placed on the General Hospital Committee, which has the task of organising the first of the Birmingham Music Festivals. 1769: First patent between Boulton and Watt for a steam engine. Boulton later seeks an extension of this patent until 1800 which was to give the pair a significant commercial advantage. 1770: Birth of son Mathew Robinson Boulton. 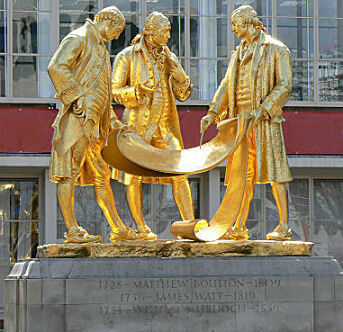 1770’s: Matthew Boulton began the first minting of coins to give a standard weight and design. 1772: The botanist Joseph Banks takes some glass earrings designed by Boulton with him on Captain Cook’s circumnavigation of the globe. These are meant as bartering goods to gibe to the natives. 1773: Opening of the Birmingham Assay Office which speeded up the process of officially marking silver in the area after a campaign by Boulton. 1774: Watt moved to Birmingham. 1775: He entered into a partnership with James Watt to build and market Watt’s steam pump. Not long after they were joined by another Scot William Murdoch. 1781: Partnership with Fothergill dissolved due to heavy financial losses. 1783: Elected a Fellow of the Royal Society of Edinburgh. 1785: Matthew Boulton elected Fellow of the Royal Society. 1788: He invented a new process of manufacturing coins which made them more difficult to counterfeit. 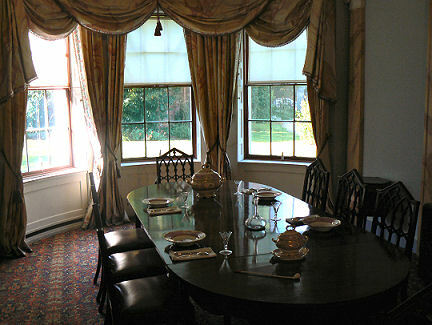 1790: Soho House is improved by James and Samuel Wyatt. 1792: Matthew Boulton became a Member of the Society of Civil Engineers. 1793: Boulton becomes Chairman of the Birmingham Theatre Proprietors Committee. 1794: Becomes High Sherriff of Staffordshire. 1795: Formation of the company Boulton, Watt and Sons. Opening of the Soho Foundry in Smethwick. 1796: Richard Trevithick visits the Soho Foundry after the opening of a purpose built steam engine manufactory. Began the remodeling of Soho House. Boulton and Watt steam engines are soon being exported to all parts of the world. 1797: The Royal Mint gives him a contract to make copper coinage at Soho Manufactory. 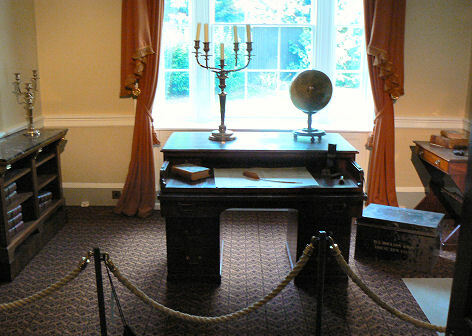 1800: Matthew Boulton became a proprietor of the Royal Institution. 1805: Boulton strikes a commemorative medal for sailors who fought at the Battle of Trafalgar. 1760 to Mary’s sister Anne who drowned in the swimming pool at Soho House, it is said because she couldn’t cope with the scandal. 17th August 1809, Birmingham, England of kidney failure. St. Mary’s Church, Handsworth, Birmingham, England. 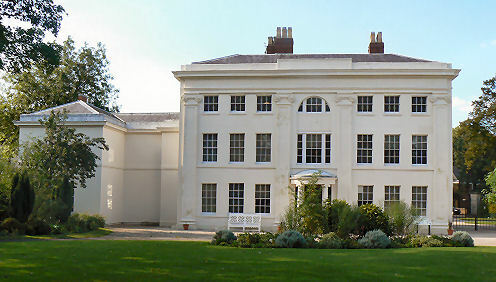 Soho House, Handsworth. (Part of Birmingham City Museums). Ornamental Work at Saltram House, Devon. National Trust. The museum has one of Matthew Boulton’s Trafalgar medals which was issued to Francis Graham, a gunner on H.M.S. Minatour. Kew Bridge Steam Museum, Green Dragon Lane, Brentford, TW8 0EN holds a Cornish Engine.